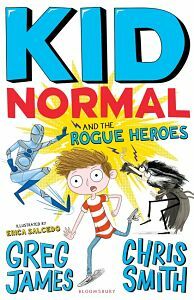 In the second book in the series, Kid Normal and the Rogue Heroes, authors Greg James and Chris Smith may have you wishing for your own super-powers or having a good belly-laugh. Who is one of your favourite authors and why? GREG: It would be daft not to include Shakespeare in a list of your favourite authors, and I know it’s obvious but it’s because no one has had more of an impact in the world of literature than him. There is no one greater. He created thousands of words, countless plot tropes that are still adapted today, not to mention the hundreds of phrases that we still use in day-to-day life. And if you disagree with me, you’re just a green-eyed monster. CHRIS: Tove Janson, who wrote the ‘Moomin’ books. It must be so brilliant to be able to illustrate your own stories. I especially love the last one, Moominland Midwinter, where the Moomins aren’t actually in the story but are just arriving back at the very end ready to hibernate. I’m getting a bit teary just thinking about it. GREG: Michael Palin, John Cleese, P G Wodehouse and my late English teacher, Mr Cook. He was a great man and I always wanted to impress him so I would always try and be a better writer. CHRIS: A series of great English teachers. Mrs Lawman, Mr Cotter, Mr Henson, Mr Greening and Dr Harris. I salute you all! 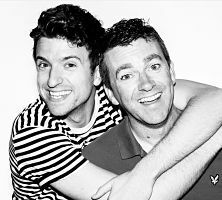 GREG: Just get going. Get going and be patient. It doesn’t just happen, so be open-minded, read it aloud and make sure you’re enjoying it. If you’re having fun, the reader is likely to have fun as well. CHRIS: Write some stuff! Don’t worry about how you do it, or whether you should already have done it, or whether you will be good at doing it, or whether you have anything to say or how the story will end. Just get a pen, pencil, sharpened stick or laptop and start writing. Kick off with an easy target like 100 words a day and see what happens. If you don’t know what to write about, get an old map and look for interesting words. Name characters after them and make them do stuff. Kid Normal and the Rogue Heroes is published by Bloomsbury, rrp. $10.38.